I love the week between Christmas and New Year’s–when the usual routines cease for awhile and some days you may even wake-up not exactly sure what day of the week it is. It’s an especially good time to spend with family and friends, and to remember too, what we’re most grateful for. Among many, many other things, I am grateful for having the opportunity to write articles and personal essays and to have the means of expression via this blog and other sites. When I first started writing personal essays a number of years ago I never dreamed I’d have enough courage and confidence to send any of them out to publications. Through the encouragement of my writers group, I’ve taken this risk now several times. And was really pleased when my essay, The Loyal Order, was published on Hippocampus Magazine in October. Today, I learned that it won most memorable for October 2012…and needless, to say I’m touched and very honored. 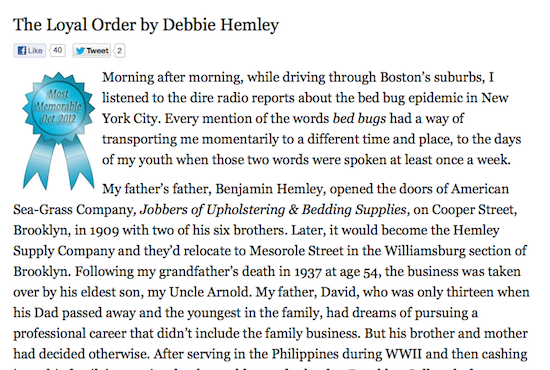 Pleased to let you know that a personal essay I wrote entitled, “The Loyal Order,” was published on Hippocampus Magazine. You can read it here. Today, I have a new 26 Tips, A-Z Guide on Social Media Examiner. This one focuses on the management of social media communities. As with all of the posts in my 26 Tips series, I thoroughly enjoyed the research, content curation and challenge of coming up with A-Z topics. If you’ve found your way here from Social Media Examiner, welcome! And, thanks for stopping by. 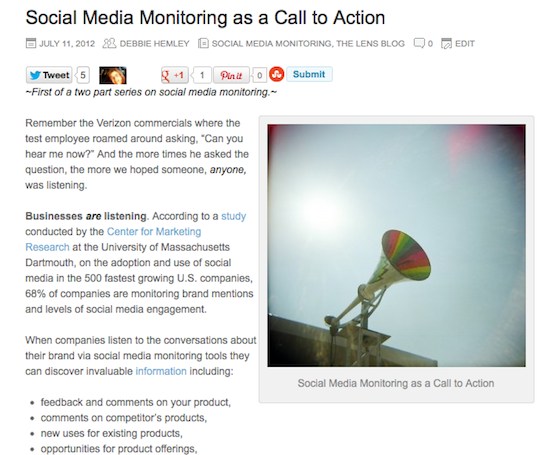 This week I explored the topic of social media monitoring for an article for Social Lens Research’s new blog, The Lens. Zach points out that we’re now at the point where all this listening and data collection needs to bring greater intelligence to organizations if it’s going to amount to anything. You can read the full article on The Lens.